intimate view of Canada's largest university. Upper Canada's first institute of higher education was originally built in the nineteenth century in a pastoral setting outside the city limits. The downtown St.George campusdeeply embedded in Toronto's dense urban coreserves a community of 70,000 students. 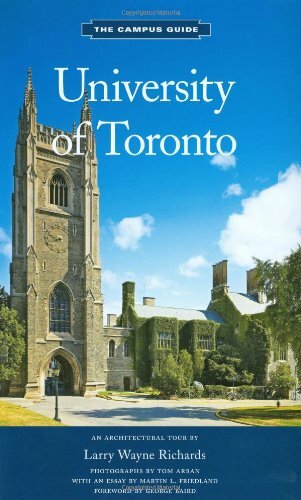 One of the highest-ranked universities in the world, it contains some of the finest architecture in Canada, starting with Frederic Cumberland's masterpiece, the Norman Romanesque-style University College, (1859). Otherbuildings of note include W. G. Storm's impressive Romanesque-revival Victoria College building (1892), Darling and Pearson's Gothic-style Trinity College Building (1925), and Hart House, designed by architects Sproatt and Rolph (1919). In recent years, the university has continued to expand with buildings designed by Sir Norman Foster, Behnisch Architects, KPMB Architects, Diamond and Schmitt, and Pritzker prize-winner Morphosis, among many others.